Posteromedial tibial bowing is a type of tibial bowing is a congenital bowing of the tibia with the apex directed posteriorly and medially. The cause is mostly physiological and is often associated with a calcaneovalgus foot deformity. Two other types of tibial bowing are anteromedial bowing and anterolateral bowing. Anterolateral bowing occurs in neurofibromatosis and pseudarthrosis of the tibia. Anteromedial bowing is associated with fibula hemimelia. Posteromedial tibial bowing and calcaneovalgus foot deformity tend to resolve over time with little clinical disability but a leg-length inequality can develop that often requires treatment. The degree of initial tibial deformity has been shown to be ultimately associated with the severity of tibial shortening and resulting limb-length inequality. The cause of shortening is not known. Posteromedial tibial bowing is a relatively infrequent disorder. Bowing of tibia is often obvious and is present at birth. The foot is hyperdorsiflexed and almost touched the anterior aspect of the distal tibia. Posterior to apex, a dimple may be present. Galeazzi test is done to assess significant limb-length inequality in children due to congenital deformities. The examination is performed with the patient supine and the hips and knees flexed. The result is considered positive if knees are at different levels height is asymmetrical. Other types of tibial bowing, such as anterolateral and anteromedial bowing. No study is required for diagnosis. Studies for rickets may be required to rule out the condition in some cases. AP radiograph of the lower extremity with a ruler is done to measure limb length and to assess the deformity. A lateral radiograph of both tibiae is obtained to assess the deformity. X-ray of the foot should be done if the foot deformity is not corrected by 4-6 weeks. Limb-length inequality value at the skeletal maturity needs to be predicted to know if any intervention is required beforehand. Limb-length inequality at skeletal maturity is most reliably predicted from a series of at least three x-rays taken at least 6 months apart. Following methods are applied. Inaccurate results are obtained if the hip is in flexion at the time of exposure. In patients with flexion contracture of knee/hip lateral views need to be used. CT is a better modality to assess limb length inequality. Prediction of the ultimate limb-length inequality at skeletal maturity is done by using one of the following three methods. Assuming growth rate of the distal femur /proximal tibia 1/0.6 cm/y, and considering skeletal maturity at age 16/14 years for boys/ girls, the final difference is calculated. 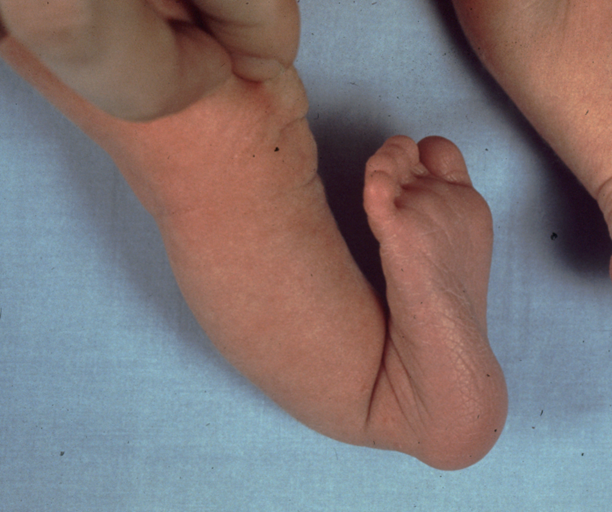 It relates chronologic age to limb length to determine a child’s growth percentile. By using this, the remaining growth of the tibia or femur can be determined graphically. It uses a combination of both the above methods. Several measurements can be plotted on a single graph. This method uses an arithmetic formula to determine limb inequality at maturity by simply taking the current limb-length inequality and multiplying it by a constant listed in a table by chronological age. Tibial bowing resolves on its own over a time. The bigger concern is limb length inequality. So assessment of limb length inequality and its treatment demands a follow up of the child. Initial treatment of the tibial bowing foot deformity includes stretching, serial casting, or splinting. A 50% correction is usually seen by age 2 years, though a mild deformity often persists. After the foot has fully corrected, a splint for maintaining correction until age 12-24 months. Tibial osteotomy is rarely indicated in a significant deformity that does not correct by age of 2 years or a persistent deformity in children older than 10 years. Most children with posteromedial bowing require a limb equalization procedure before skeletal maturity. The type of procedure depends on the degree of predicted limb-length inequality at skeletal maturity. Generally, the limb-length inequality 2-6 cm at skeletal maturity requires intervention. Limb-length inequalities of more than 5 cm are difficult to treat with a shoe lift. Epiphysiodesis of the contralateral limb to arrest the growth at an appropriate time can restore limb-length equality in most of these cases. A limb lengthening procedure of the ipsilateral limb may be indicated for more projected limb-length inequalities >5 cm, especially in children with short stature. Epiphysiodesis is done at age of 11 years in females and age 13 years in males but it can vary depending on the patient’s skeletal age and the degree of the limb-length inequality. Epiphysiodesis inhibits growth and works only in a patient who is left with growth potential. Thus it is not suitable for patients who have reached skeletal maturity or do not have required period before they reach the maturity. Lengthening is usually performed with corticotomy and gradual distraction and is performed on the involved side. The expected goal is limb-length equality in posteromedial tibial bowing is within 1 cm at skeletal maturity. Halo vest consists of a halo and vest. Halo is a ring that encircles the head and is fixed to it by … [Read More...] about What Is Halo Vest?